Today is the day I start planning and making Christmas presents for next year.When I started making gifts in June last year, I thought I was totally on top of things, but I did not give myself enough time. I found myself at the end of the season frantically buying supplies and completing projects (and adding last minute projects!) and I ran out of time to come up with good ideas that didn’t use anything new. Now, don’t get me wrong, I didn’t do a terrible job. I made several gifts out of my stash of supplies. 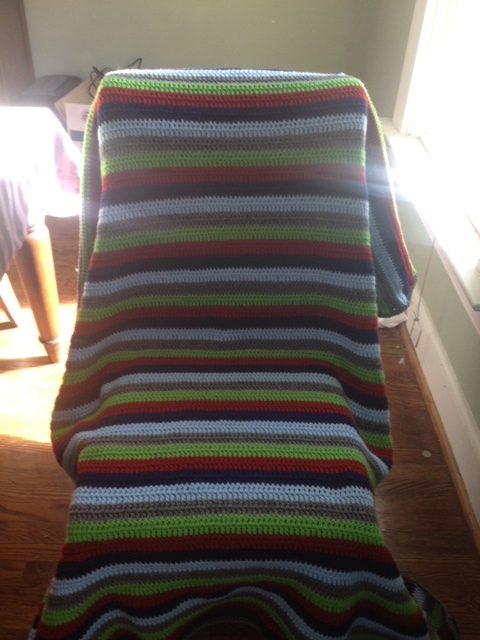 I made a large blanket for my brother that did require yarn purchases, but still met my rules because I started with stash yarn and only had to buy some additional yarn to complete the project. But I could certainly do better. Overall, I think I did pretty well. The majority of the gifts I gave were handmade, and I don’t feel too bad about the ones that were new. Makeup is even sort of meeting the rules, because it is consumable. The games are something I should have made an exception for, in retrospect. Anything that encourages the children to spend time NOT watching TV is a good thing, in my book. And at least the scarves were made by me (because I made the girl that made the scarves, 😉 ). I do think I could do better next year, though, if I start planning now. If I had started with a better plan for the gifts, I wouldn’t have been adding things at the last minute. I am still at the beginning stages of planning, but I will definitely need to have a plan in place soon. I hesitate to say that it will be a complete plan, because things always change, but I want to have at least a framework by the end of this month. Am I the only one crazy enough to start thinking about this now? I am not a fan of Christmas music in October or early November, and it drives me crazy that Christmas merchandise is everywhere already, but when you are a person who makes things for Christmas presents, you have to start early. 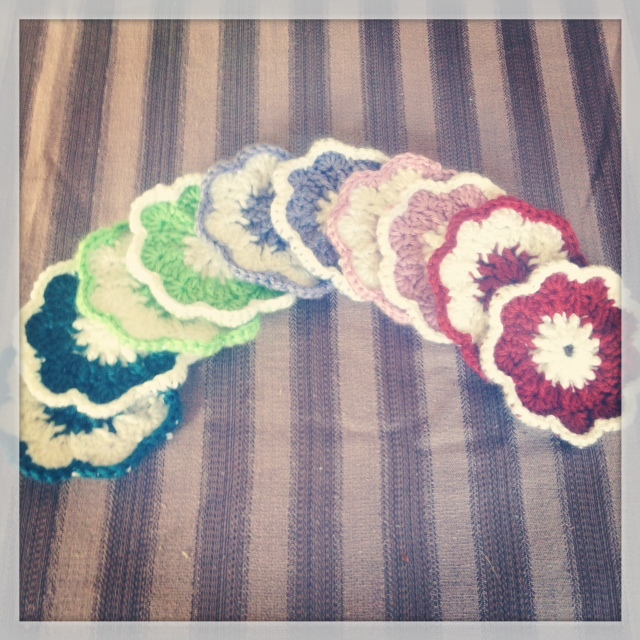 I did start early this year, too–I have been making blankets and scarves since June. However, this weekend I suddenly realized that Christmas is less than 2 months away, and I still have so many things left to do! I can’t post everything here, on the off chance that some of my recipients will see this post, but I can say that I have gotten a lot done. 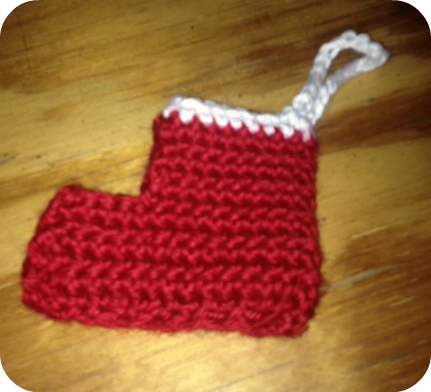 Yesterday I experimented with mini-stocking ornaments to make as a decoration for all of my gifts this year. I made three of these, each slightly different, to perfect the pattern (or really, my interpretation of it). I’ve nearly got it down, and I am pleased with how quickly I can knock these out. 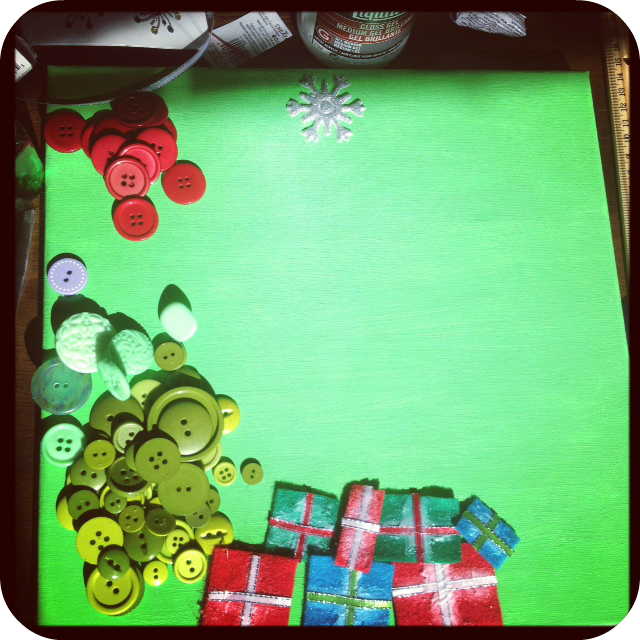 I also started a collage for my aunt, based on this pin. Last night I painted my canvas to get ready, and I have been working on it off and on today. With collage, I often have to stop and let the glue dry a bit, so it is good that I started now, when I have time to come back to it over several days. I also finished a scarf and worked on a blanket that I can’t post here. All of this is making me feel a bit better, but there is still so much left to do! Anyone else making Christmas gifts this year? What kind of progress are you making? How Do I Know When it is Done? About a year ago, when I first started thinking about being creative every day, I was very excited about collage. 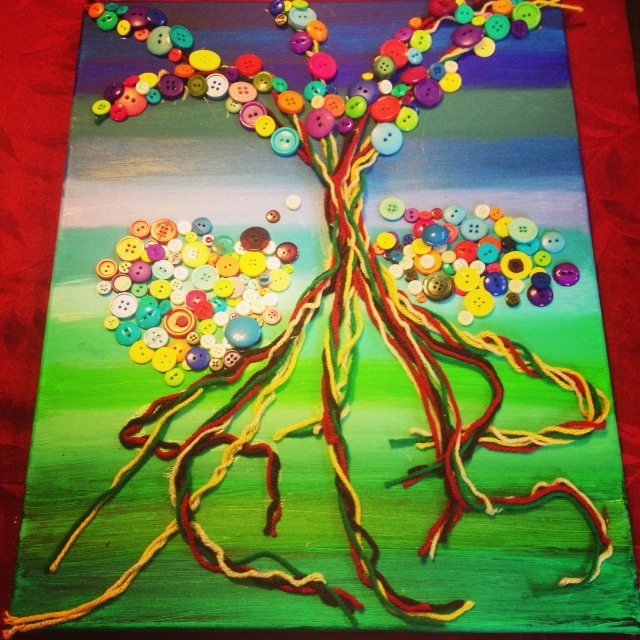 I saw a lot of mixed media art that I loved and wanted to emulate in some way–not to make the same projects, but to take the idea of creating something new out of disparate parts and make my own projects. I wasn’t sure where to start, so I just dove in. 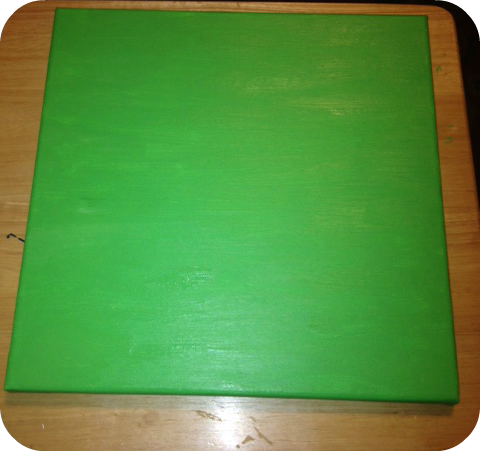 I painted a canvas with a an abstract grass and sky theme. I really liked this canvas, and I didn’t want to mess it up by just diving in with no plan, so next I spent some time experimenting. I glued yarn to a practice canvas I had laying around. I tried a couple of different glues to see what would hold the buttons best. I got out a few different colors of yarn and experimented with making the trunk. I tried crocheting a trunk, but it came out too big with the multiple yarn colors I wanted to use, so in the end I decided to just twist the colors together and glue them down that way. I worked on this over several weeks, working for a bit, then leaving and coming back the next day. 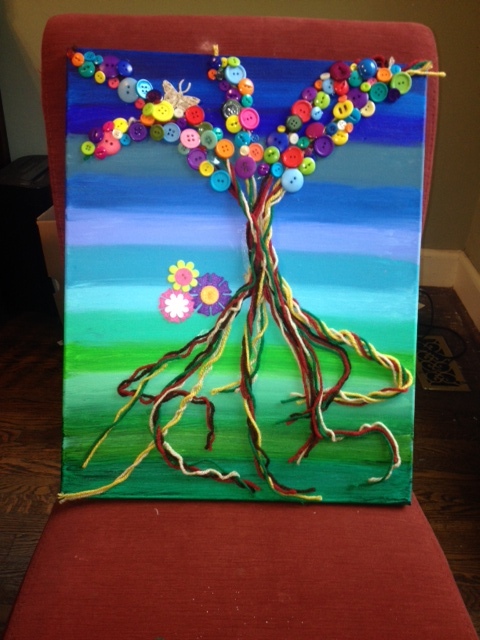 The original plan for gluing the yarn down was to make the roots relatively shallow on the canvas, trailing off, with a huge tree above with lots of button leaves. When I stepped back and looked at it after I got most of the yarn in place, though, I realized I had done it completely backwards–the long branches were in the green ground part, and the shorter roots were in the blue sky part of the canvas. D’Oh! I certainly wasn’t going to try to take the yarn off and re-glue it. After I thought about it a bit, I decided that long roots are better anyway–much of a tree really is in the root system. 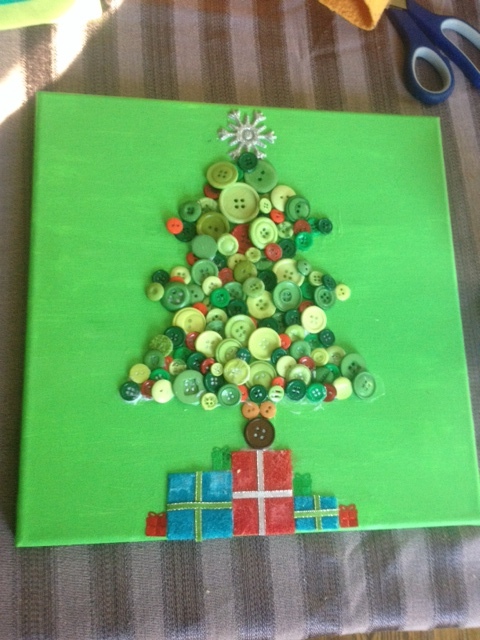 So, I started gluing on buttons. I really enjoyed the process of coming back to this over and over again, sometimes stealing just 10 or 15 minutes out a busy day to glue on some buttons and look over the project. Sometimes the canvas would sit for days at a time without me looking at it all (which reminds me of the need to get more of a studio space than the corner of my dining room table…), but I found that valuable, too. When I came back, I had fresh eyes. This week I got it out and looked at it again, and I find myself not sure what the next step is. Is it done? Does it look a bit barren at the bottom? Should I put a few button-leaves along the trunk? I am not sure if it is done or not, but I don’t see anything that it needs, if that makes sense. Always before I would look at it and think it needed more leaves or something at the ground level, but now I look at it and nothing jumps out as necessary. I am still pretty new to collage, so I am not sure exactly what I want, but I am enjoying the process! When I was deciding to do a year long project focusing on making something every day, I came across Making Made. This project really spoke to me, because Jeanne didn’t decide on a unifying theme for her project (like an owl a day, or a robot a day, for instance), she just decided to make something every day. I didn’t feel that there was a specific theme I wanted to commit to doing daily, but I could get behind the idea of making sure creation is a daily occurrence in my life. I have been wanting to make more things for a long time, but daily life gets in the way so often, and I wanted a spur to daily action. Plus, I want to branch out, try more techniques, and make more of what I use in a global sense. So, the whole blog was inspiring to me, but her Deer Chicago collage really stood out. Go look at it, it is awesome. I have been interested in collage anyway, but after seeing this, I realized how much opportunity there is to create something uniquely meaningful through collage. The deer in this picture is from a photograph Jeanne took on a hike, and the Chicago skyline is a vintage photo. I love the way the personal photo is juxtaposed with the vintage photo and the text making up the street. I don’t actually have a collage (although I guess my Christmas art could be considered collage), but I did paint a background on a canvas this weekend that will be the basis for a mixed-media project. Obviously, there will be actual collaging on top, but I am very pleased with this background. 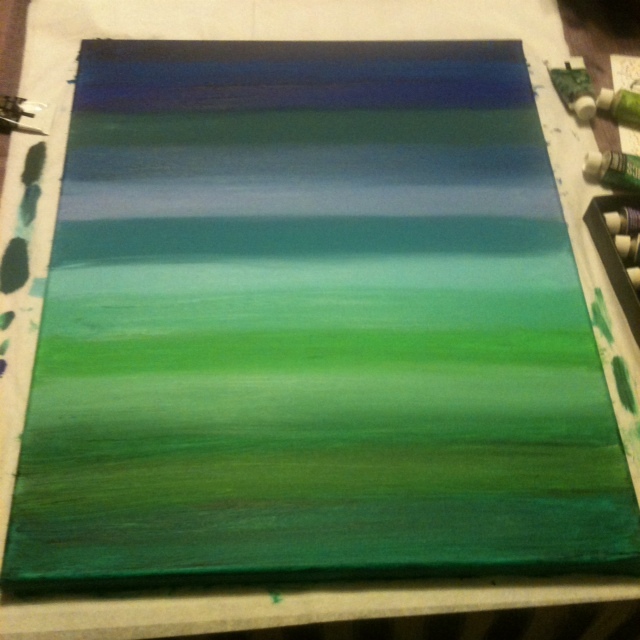 It is an abstract idea of grass and sky, and I love the color changes. Now, I just need to figure out how I want to do the rest, and get a block of time to work on it. I did some experimenting this weekend with attaching yarn to another canvas, because yarn will be involved here., but I am still thinking through the overall approach. Do you make collages? What kind of materials and adhesives do you use?